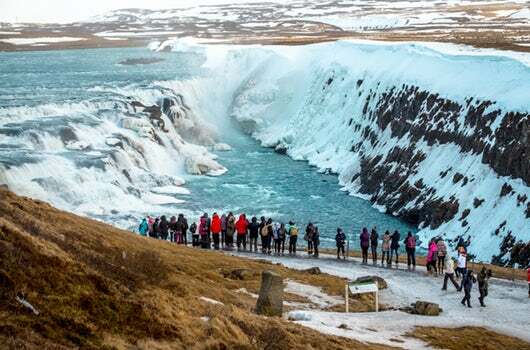 On this tour, you will see the world famous erupting geyser & hot springs, experience the magnificent Gullfoss Waterfall and follow in the footsteps of the Vikings of old as you walk down the lava canyon where the American and Eurasian continents are literally pulling apart in Þingvellir. The day will end with horse-riding through meadow and lava fields. ​​The tour starts with a stop in Þingvellir National Park, a UNESCO World Heritage Site listing and the birthplace of the oldest existing parliament in the world. This is also where the gigantic tectonic plates of America and Eurasia have pulled apart and the resulting rift valley is right there before your eyes on the shores of Iceland’s biggest lake. The horse riding tour will takes us through meadows, lava fields and a small river. We will enjoy the picturesque scenery of volcanic mountains and farmland, passing several farms, giving us an idea of how Icelandic agriculture has developed in the last decades. The trails are good for horse-riding, giving us an opportunity to experience the special gait of the Icelandic horse “tölt”. The first stop is Þingvellir. Located on the northern shores of lake Þingvallavatn, Þingvellir is the national pride of Iceland and our first National Park. It is, for one, a key location in Icelandic history as the oldest existing parliament in the world first assembled there in 930 AD. Aside from being a location of historical significance, Þingvellir is also protected as a national park due to its unique geology and natural features. The second stop for today is Geysir. The home of the original geyser and Iceland´s most iconic natural site. There the ground shakes and super heated water erupts into the sky from the famous Strokkur geyser every few minutes. The third stop is Gullfoss Waterfall; a powerful and inspiring place. There the glacier water thunders down 32 meters in three steps and into a narrow canyon. The tour ends with a Horse Riding tour in Icelandic scenic landscape. ​The first stop along the Gold Circle features a stunning views over the rift valley. A UNESCO heritage site with beautiful geographical features and a rich political history. ​Eldhestar horseback riding center offers a variety of horses and is suitable for riders of all abilities. The last stop along the tour will be at Eldhestar, where you will have the chance to get closeer to these majestic animals. 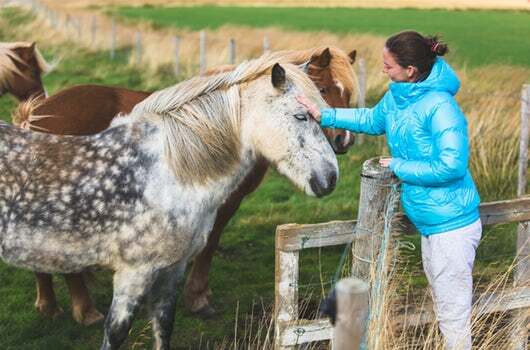 Along with getting acquainted with the Icelandic horse, you will also have a taste of the countryside around Hveragerði. Children can be lead by staff at Eldhester if needed. Enjoy the day with Iceland's famous and charming animal. After a 1 hr ride, you will be brought back to Reykjavik by the Eldhestar staff. Duration: Approx. 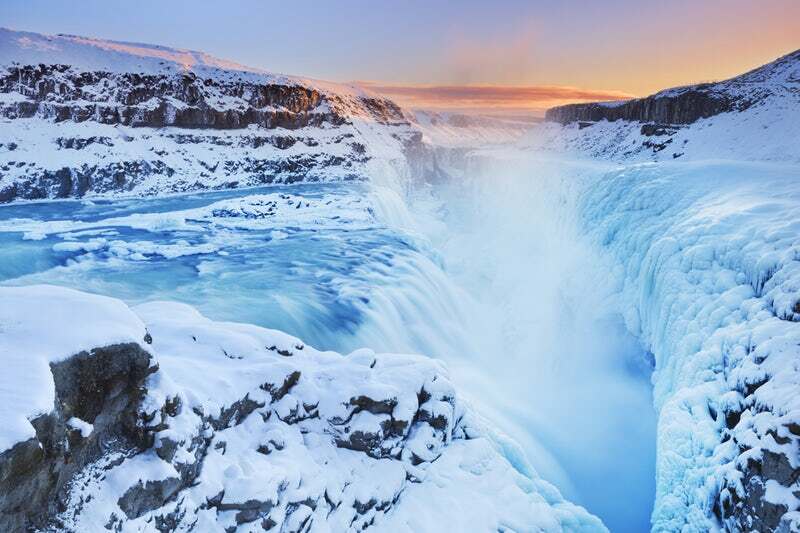 11 hours including a minimum 30 minute stop at Geysir Hot Springs, Gullfoss Waterfall and Þingvellir National Park. In Geysir & Gullfoss there are shops where you can buy food and drinks. Important information: You cannot be pregnant for the horse riding tour and if you weigh more than 110 kg, please contact us.